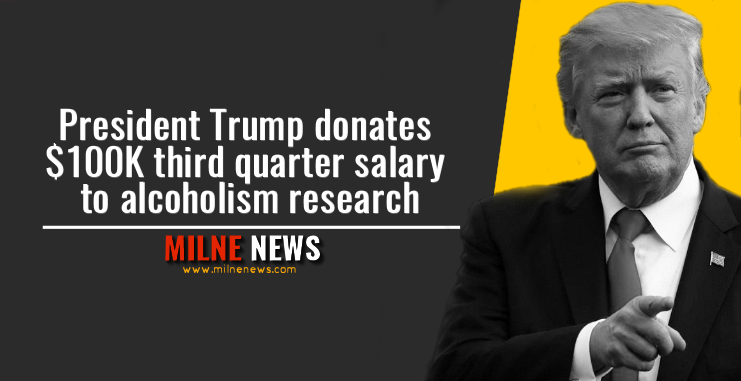 President Trump has donated his third quarter salary of 2018 to the federal agency that researches alcoholism and alcohol-related problems. The White House says the president donated $100,000 to the National Institute on Alcohol Abuse and Alcoholism. Alcoholism is a personal issue for Trump. His older brother, Fred Jr., died in 1981 after struggling for a while with alcoholism, and president Trump has said he learned from his brother’s experience. Trump promised as a candidate in 2016 to not accept the $400,000 annual presidential salary if elected. By law, a president must be paid, so Trump has kept his promise and donated the quarterly payments to various federal departments and agencies. The departments of Education, Health and Human Services, Transportation and Veterans Affairs, among others, have accepted president Trump’s donations.